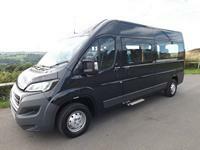 New Peugeot Boxer CanDrive 12 seat 3.5 Tonne Minibus. Available in compact medium wheelbase or spacious long wheelbase version with boot space and lots of legroom. Due to being 3.5 tonne this Minibus is ideal for Schools or Charities where drivers passed their test after 1997 and do not have a D1 Licence (Conditions Apply). Yes, you CanDrive this Minibus on a car licence if you meet the right conditions. Latest Euro 6 2.0 tdi engine with 6 Speed Manual. Driver — double front passenger seat (single front passenger seat option available). 9 rear seats, all with 3 point all age adjustable seat belt - choice of easy clean wipe down vinyl or cloth/fabric finish. Side step (manual or electric option) and handrail at sliding door entrance. Fully safety inspected/certified by VOSA and IVA Type Approved. Generally available in silver and white from stock, other colours available to order. Wheelchair accessible modifications available if required. Sign writing and delivery available. Prices from £23,995 + VAT depending on model and specification. Photos used for illustrative purposes only.